A restaurant in North Greenwich from Stevie Parle, serving some interesting food at amazingly high prices - but with a very good cocktail bar. Of course it’s a good thing for chefs to source their ingredients carefully, and then create interesting dishes. On that front, Craft London delivers, boasting properly aged rare-breed meats, an acutely seasonal all-British cast of ingredients, and an intricate and engaging menu. However, at some point during the meal, I started to feel less like I was getting a good deal and more like I was subsidising the chefs’ hobbies. Meats are cured, butter churned and even coffee roasted in-house, while the kitchen team experiment with the lacto-fermentation of vegetables and keep their own bees. While Craft’s impeccable sourcing and the skill of its chefs are undeniable – each ingredient is exemplary of its type, each dish perfectly cooked and presented – none of the dishes we tried transcended the sum of their parts. A starter of half a carrot, two spears of asparagus and a drizzle of creamy mead and anchovy sauce (for an overpriced £12) underwhelmed; better was an attractive plate of chopped raw Highland beef with salmon roe and diced pear, the intriguing contrasts of textures and flavours all balanced on sweet vegetable crisps. Hereford beef sirloin had a lovely chewy grain and deep wood-grilled flavour that the accompanying dab of bone-marrow sauce and splash of lovage liquor did little to counterpoint. Sides were small and cost a fiver a throw. A cocoa-rich, coffee-laced chocolate fondant with a delicate sugary crust was an intense finish to the meal. The prism of high pricing can’t help but distort the pleasure of the dining experience. When you’re spending at least £150 for two even when being abstemious, you can expect a comfortable ride at the very least. But the bum-shiftingly unforgiving turquoise chairs at the overlit tables at the edge of the room are to be avoided. These naff design fails are in stark contrast to the considered and luxurious experience suggested by the menu. There are good things about Craft London, not least the cocktails, which are laced with own-made tinctures and infusions. But unfortunately for proprietor Stevie Parle and his team, the most memorable thing about this meal wasn’t the imagination of the cooking but the shock of the bill. 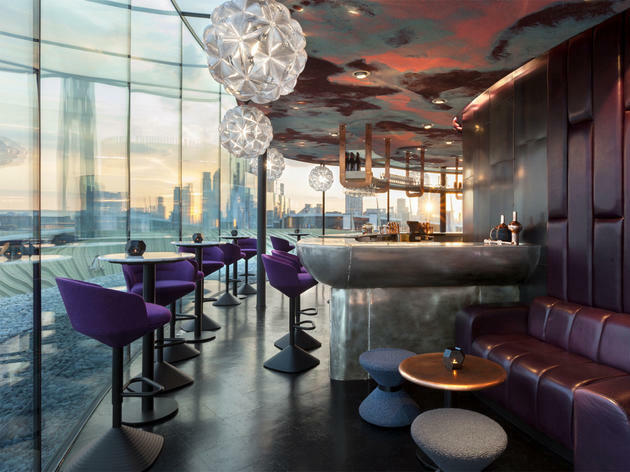 Craft also has a cocktail bar where you can enjoy the same wonderful views while drinking well-made drinks. This is by far the more affordable option. Meal for two with drinks and service: around £150. Café open Mon-Sat 8am-6pm; restaurant open for lunch Wed-Sat noon-2.30pm, for dinner Mon-Sat 5.30pm-10.30pm. Bar open Mon-Sat 5pm-1am. Popped in here for a quick drink after an event nearby - a great location to nip in and avoid the crowds at the tube station. Service was a little slow, and the cocktails were nothing special, but the setting was modern and the views pleasant. I only visited the cafe portion, but it looked so interesting I thought I'd try it. Excellent coffee, location and nice outside seating. The cake however was disgusting! More of a personal thing I guess. Take my review with a pinch of salt; I only visited the cafe portion of Craft London, and the coffee and pastries were pretty reasonably priced, about the same you'd pay at a hipster cafe anywhere else. I loved the layout of the place, and there was some really instagram-worthy furniture in blue (favourite colour). It's got a lovely view outside, particularly in the late afternoon as the sun is setting, and you can see the dying of the light cast over the entire peninsula. Their coffee is great, they have a La Marzocco, so I wasn't too surprised, and there's free wifi too. I'd definitely come back here for a coffee if I happen to find myself in the Greenwich area again (not too often), and is certainly one of the more interesting shops in the O2 area amidst the dozens of restaurant chains otherwise. The atmosphere here is great - really buzzing some nights, but on the two occasions I have been to the cocktail bar here, the cocktails I've ordered just haven't been right in some way. I'm not sure if I was just unlucky with the bartenders I had got (one of them was quite new), but as they're almost always busy when I attend, they must be doing something right! I would make a suggestion to grab something light before going here if you're just going for drinks, as there aren't many snacky bar options. I’ve been just to the cocktail bar, not the restaurant. 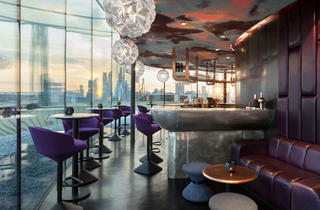 The setting is just great, with beautiful views as glass windows surround it – there is not a bad seat there. I was there early, it seems, as it was pretty empty; the bartender told me it get pretty packed after the O2 events. I had a caipiroska and a dark’n’stormy, both perfectly done. And I can’t fault the service; everyone was extremely welcoming. Only went to the bar - the cocktail was not memorable (called the Cutty Sark) but i couldn't taste really what it was (two of the bartenders were catering for a party next door so maybe the quality wasn't as good as usual). They have a very limited bar menu with nothing snack like (i mean, chips please)! So we ended up ordering the pickled veg with a a generous smear of yoghurt. It was good but it needs more veggie options. If I was to come back to Greenwich Peninsula I'd want to make sure there were more veggie options before doing so. great food and really nice atmosphere. The views are pretty given the huge glass windows and there really is no bad seat in the restaurant. The food is really innovative and is not for everyone, with some misses but some huge hits. Really great venue to head to before or after concerts at the O2. Honestly this is one of the better options in the whole North Greenwich and I am glad for this new addition. Service was top notched and was the cherry on top of a really enjoyable meal. Shout out to their bartender and also whoever picked that decent range of craft beers!